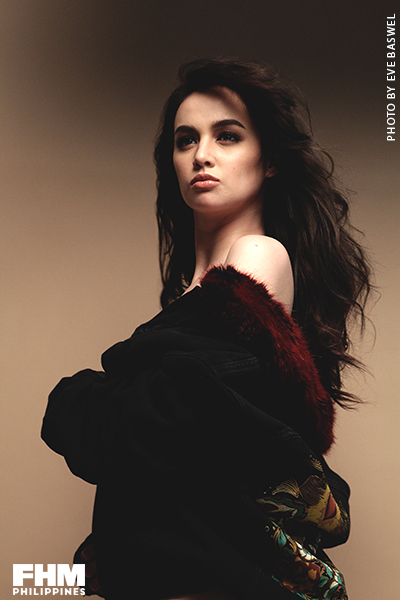 Kim Domingo has always been a star-in-the-making. All she needed was that push in the right direction to solidify her place as one of the most sought-after actresses in the industry. If you think the viral videos she posts were doing well, try checking out her network’s YouTube page and you’ll see that the skits from that feature her literally make up half of the Top 10 most-viewed videos. If that’s not a sign of people wanting to see more of her, we don’t know what is. As soon as she got in front of the camera, we knew we were handling a whole new Kim Domingo. She barely needed any guidance from the photographer, Mark Nicdao, as she posed in front of the camera effortlessly. “Ibang-iba nung first cover shoot ko. Hindi pa kasi ako ganun ka-confident nun. Ngayon mas confident na ako. Wala akong pakialam kahit maraming nanonood, basta nasa isip ko ay dapat magandang-maganda ang kalabasan ng shoot,” says Kim. That’s one thing that hasn’t changed about Kim—she’s a woman who knows what she wants and will do anything to achieve her goals. We’re just as excited you guys are for what’s in store for Kim’s future so we know the wait is excruciating; good thing she still posts those steamy viral-worthy videos on her page. Thanks Kim, you never let us down. When you’re finished appreciating a few of her videos on the Internet, why not enjoy some of our behind-the-scenes photos below. Or better yet, why not just by the magazine and not only get to see more of Kim but also get to know our predictions on what’s going to be in this 2017 (“Hot Acts To Watch Out For This 2017,” “These Things Are Going To Be BIG This 2017”), as well earning enough dough with our “How To Get Rich” feature. All that and a Ginebra San Miguel calendar in our first issue of the year. Oh yeah! FHM January 2017 will be available in the following days in supermarkets, convenience stores, newsstands, and bookstores nationwide!